Melodic doom metal is not a genre that has ever bespoke of good taste to me, so I approach the sound of an album like this with a fair bit of trepidation, a blackened funeral doom (or more precisely doom'd black metal) from the distinctly Italian strain of underground black metal, which from my exposure (to Absentia Lunae and Melancolia Estatica) takes a wee bit of a "gothic and melodic metal can be ok" attitude. However this album doesn't veer over the edge into what I consider cheesy about these genres, the closest it gets is with some clean sung vocals, which as they turn out are not totally unnecessary and at least don't get in the way. The same kind of psychedelic cavernous reverb that soaks the best work of Elysian Blaze, seemingly inspired by Lycia, is found here. 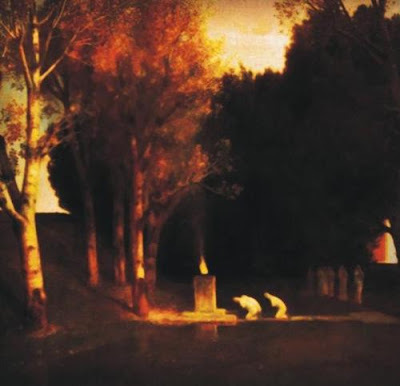 What helps matters even further is that the band certainly takes its influences from the right places, strains of symbolist and decadent art, writing, and mysticism from the late 19th century. The band itself is named after a text (meaning, vaguely, Celestial Secrets) of Christian mystic Emmanuel Swedenborg, but more specifically the name is inspired by bleak Swedish poet August Strindberg's tormented visions related to the work in works like his Inferno. 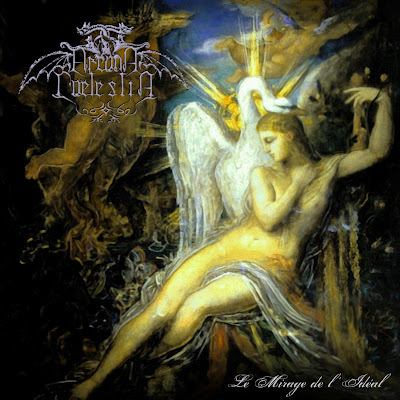 Beyond this, the cover art is of Leda & the Swan from what I am almost positive is a Gustave Moreau (by far one of my favorite artists ever) painting, and the band has submitted other symbolist works as band images. Eerily holy and temptestuous music of the internal life.